The ALA Library responds to inquiries from staff and members, plus others interested in, or doing research about, libraries. Here is the link to the ALA Library Resource Guides that provide a guide to sources for specific types of statistics about libraries in the United States. 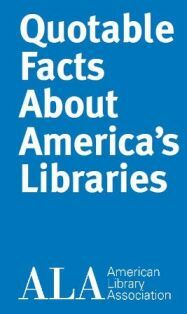 The ALA Office for Advocacy offers Quotable Facts About America's Libraries in English and Spanish - bring one of ALA's most recognizable advocacy tools to your community. These wallet-sized fold-out cards are packed with clever quotes to help make the case for libraries. Hand them out with your business card. Bring them to your legislators or keep one for yourself. In English [PDF] or in Spanish [PDF]. Citation: Reprinted from the Library and Book Trade Almanac (Bowker Annual), Vol. 59, copyright 2014 Information Today, Inc.
Citation: Reprinted from the Library and Book Trade Almanac (Bowker Annual), Vol. 58, copyright 2013 Information Today, Inc.